Once in a lifetime opportunity to see Bagpipe bands in action! Bagpipe bands have a rich history and culture. They are revered in many parts of the world. A Scottish heritage, the bagpipe has come along way to incorporate different music styles. They are among the most well-known instruments in the world today. Artist on Demand brings you the exuberance and the experience of a great bagpipe band in action. 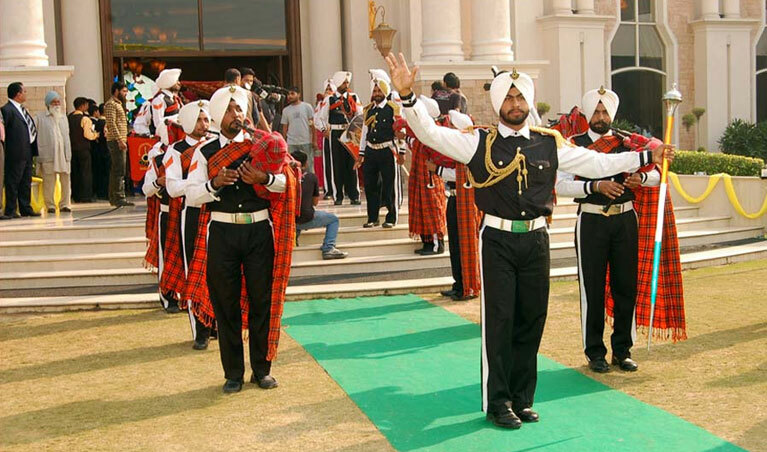 We have been providing first class entertainment for many years.All musicians are members of the Bagpiper’s Association in India and any piper who plays at your event is playing at the Grade 3 level or higher. This means that your piper will be highly skilled, have an amazing repertoire, and their pipes will be brilliantly in tune! This makes a huge difference and should always be considered when hiring a piper. Your family and visitors will be lost for words when they see the pipes and drums come marching up the driveway during the rehearsal dinner. It will bring an excellent end to an excellent day. Whether it’s a birthday party, a ceremony, an engagement, or even a marriage, our bagpiper band will be right behind you are making your event a big hit! They simply give a 5-star performance. They do a phenomenal job. You could not have been happier. You will recommend them to all my friends and family. If you are thinking about getting a bagpiper, it is well worth it. It adds an awesome atmosphere to our cocktail hour. Most of our customers are repeat clients who loved our performances and call us again and again. They recommend us to family and friends.You can hire our bagpipers for Parades, Weddings, Memorials, Dedications, Graduations, Birthdays, Corporate events and Charity Fundraisers and other events. The band has been performing for many years and we don't know of a more professional and committed group of musicians - they really are an event organiser’s dream and we are very happy to strongly recommend them. Get an instant quote and availability check right now by making a quick enquiry with Artist on Demand . The band is fantastic, and we would recommend them to anyone looking for something that is a little different. If you are looking for Bagpipe Band in Delhi, this is it. Call us now for a great evening. Here’s hoping for a great show!